Life Point: People can choose to forgive others like God has forgiven them. When you think of a soul, it brings to mind images of light and uplifting thoughts. Over time, misdeeds and sins weigh down the soul and make it heavy. You can teach your youngster about the importance of forgiveness by demonstrating the heavy soul and how much easier it is to carry around when it forgives and is forgiven. Start with an empty shoe box and get your kiddo to hold the box. Ask her how it feels: “Is it light or heavy?” and “Would it be hard to carry this empty box around?” Of course it would be easy. Next, add two or three rocks to the box and hand it over to your youngster again. Ask the same questions. This time, there’s a little bit of weight in the box, but not enough to make it an impossible task. Continue on until the box is just too much to carry easily. Now you can explain the similarities between a heavy soul and the heavy box. Forgiveness is important because it keeps the soul uplifted and prevents it from being weighted down. Forgiveness isn’t something that can be taken; you may not be able to see it or touch it, but it’s a gift that you can give to someone and a wonderful gift to receive, too. Help your kiddo turn an ordinary gift box into the prettiest gift box she’s ever seen. Wrap the lid and box separately in decorative wrapping paper, and then pull out the craft supplies and let your little artist take over. She can adorn the box with bows, ribbons, glitter and anything else she can find. When the gift box is complete, help her think of something that has upset her recently and help her forgive. Write the words “I forgive” and then the scenario on a piece of paper and place it in the gift box. She can give the box to someone or place it in a special area in the home. Come back to the activity every once in a while and add more forgiveness notes to the box. 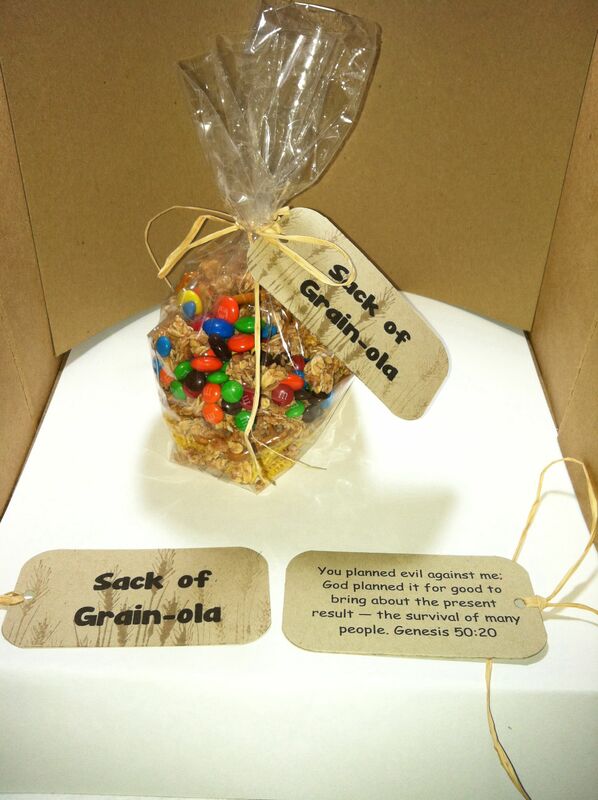 You will just have to go off the picture for how this is made but it looks like granola and then M and M’s put in a bag with a tag on it that says “Grain-ola” and then the weekly verse on the back of the tag. A game that talks about forgiveness and how it is not as easy as anticipated.